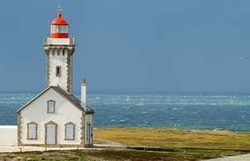 Brittany is a very well established tourist region and serves the whole of France as well as Europe for holidaymakers. A significant part of the local economy now depends upon tourism, and most sports and activities are well catered for in the region. There is no shortage of things to do when holidaying in Brittany - it is more of case of having to decide what to leave out. Our cottage has an extensive library of maps, guide books, walking guides and cycling guides to help you decide if you are the sort of person who likes to plan your days out. Alternatively, just drive out and explore to see what you discover. There is a large choice of sandy beaches, all within easy driving distance, where you can enjoy swimming, sand yachting, waterskiing, windsurfing, snorkelling, kitesurfing, sailing or body surfing. 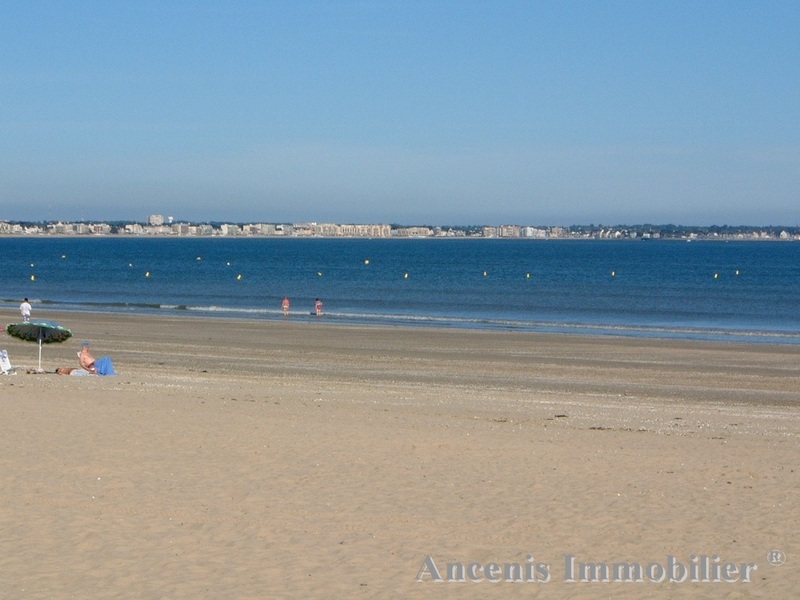 The Plages.TV site provides a useful list of dozens of beaches to choose from, depending on whether you want ease of access, facilities or peace and quiet. 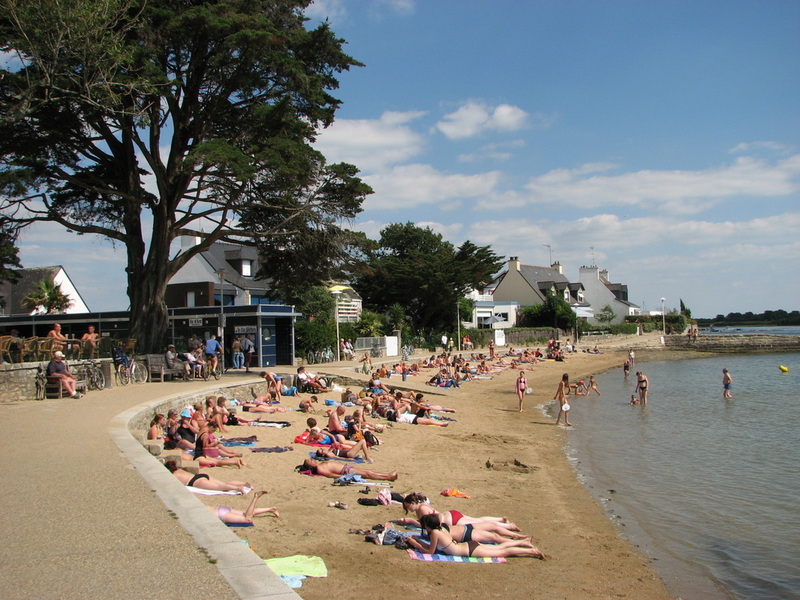 One of the closest beaches is at Conleau, Vannes, where a retaining wall ensures the tide is always in! (28 mi/0h44). A nearby sandy beach that is recommended for children is at Port Louis which has a wall which provides shelter and a nice beach side cafe (46 mi/0h48). 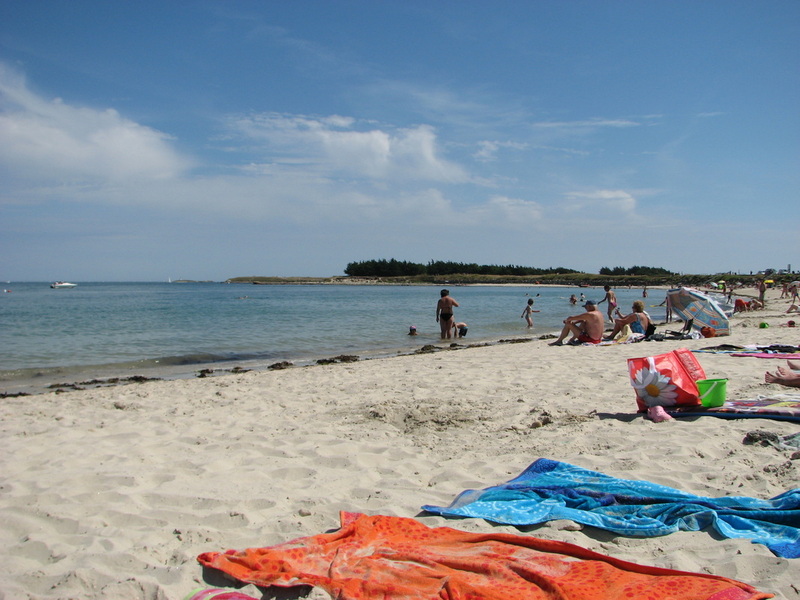 Other popular beach locations include Carnac, La Trinite Sur Mer and St Pierre-Quiberon, and all these beaches are recommended for children. La Grande Plage Canac was recently recommended as one of the best 20 beaches in France (France magazine), children will love the clean soft yellow sand and the beach is looked after well. There is a nice beachside promenade to walk along, and plenty of places to eat and drink. Damgan is where the French tend to holiday and there is a wide variety of stunning beaches with the town and restaurants less than 100m from the beach. There are also quieter beaches, where you will find nature reserves, sand dunes and open spaces including the long dune belt from Gavres to Penthièvre. All around the Golf du Morbihan there are tiny beaches and rocky coves where you should be able to find a spot just for yourselves. The beaches are invariably unspoilt and clean. The most popular coastal areas can get busy in peak season, but there are always quieter alternatives waiting to be discovered. The Cote Sauvage is exposed and generates large rolling waves from the Atlantic, so proves popular with surfers. If you should find yourself on the north coast of Brittany the beaches of St Cast (67 mil/1h42) and St Jacut are also beautiful. Brittany's largest island, Belle Ille, lies 8½ miles offshore, and is reached by ferry from the port of Quiberon. The island is very popular for day excursions and well worth a visit. 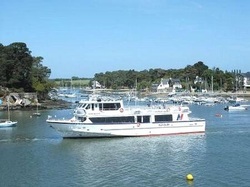 You can also take a cruise around some of the islands in the Morbihan, hop-on hop-off as you please. It is possible to hire cycles on some of the islands. For a day, or just an afternoon, leave Port Navalo aboard a cruising launch (possible halt on Ile aux Moines). Take a map to follow the boat's course through the multitude of islands and fairways (April to October). We enjoyed a boat trip to the island of Ile aux Moines where we spent a couple of hours before returning to Vannes (click here for our photos). One of the main companies offering trips is Navix. Based in Vannes, this company offer lunch cruises, dinner cruises, tours of the inland sea of the Gulf of Morbihan, day trips to Belle Ile, and cruises up the River Auray. The closest departure point to our cottage is at the Parc du Golfe, just outside Vannes, where you can park free of charge. Several traditional sailing ships also offer day trips round the Gulf. 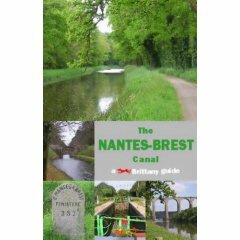 The Nantes to Brest Canal is a wonderful leisure facility, and passes nearby through the centre of Josselin (the River Oust and the canal join). The good quality paths make for the ideal surfaced route for either walking or cycling. You will find many pretty flower decked lock houses along the canal, together with regular 'halts' containing picnic tables and benches - sometimes even a boules pitch. 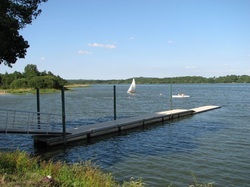 These rest areas are an ideal spot for a picnic lunch, and are called haltes nautiques. In the summer you can hire boats for trips along the Nantes-Brest Canal at Josselin and Malestroit. 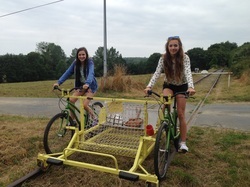 During the summer holidays, cycle hire is available in Josselin from the car park adjoining the canal near the chateau. Click here to view our canal cycle ride photo album. More information on the Breton Canals is available here . Canoes can be hired at Josselin, Pontivy, Plumeliau, Pont Augen or Lochrist. 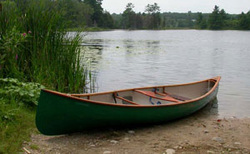 Suitable for beginners and experienced canoeists alike. It is also possible to hire a qualified instructor. The River Blavet is ideal for canoeing and kayaking. At Lochrist, there is a canoe centre which has mini rapids and obstacle courses, great fun for all the family. Whether you are seeking the adventure of sea-kayaking, or the more relaxed exploration of the Nantes Brest Canal, there is a centre who can hire you equipment and cater for your needs. 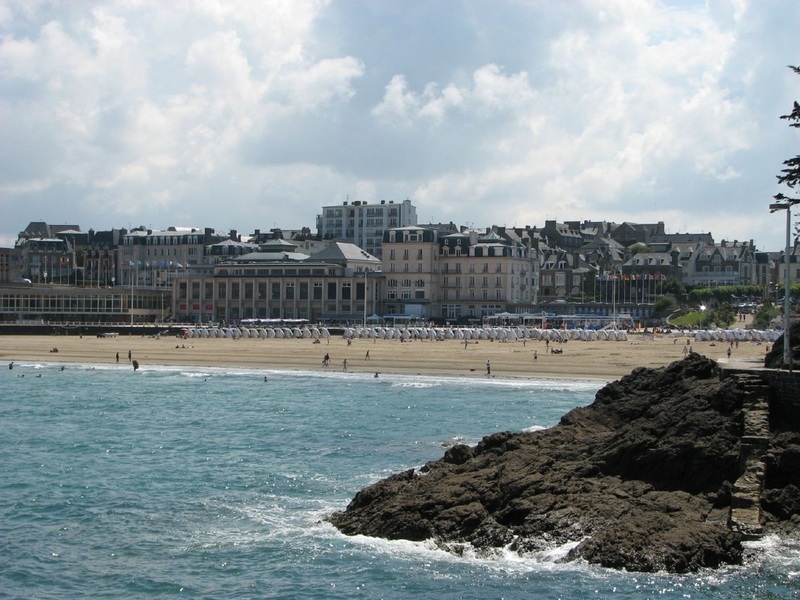 The Nautism en Bretagne web site lists establishments offering facilities. The French love to cycle, and there is no shortage of choice for visitors to the Morbihan region. 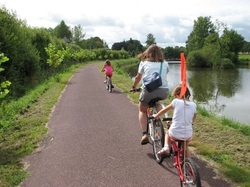 You can enjoy long leisurely cycle rides along the well maintained towpath of the Nantes-Brest Canal. The level footpaths of the canal are a great way to discover the area. You can access the canal near Josselin, just 3 miles from our cottage. Click here to view our canal cycle ride photo album. For a more energetic ride, explore the local country lanes and cycle routes. As the roads are uncrowded by UK standards and well maintained, this is a great way to explore the local villages. The undulating hills of the area do mean that you will either have to be reasonably fit, or else get off to push up hills! A great day trip would be a cycle to Lizio for lunch. There are also many off-road cycle routes in the area. We have six bikes available which you are welcome to borrow (free of charge) plus there is a bike hire shop in Josselin, or bring your own. Ours a mostly off road bikes in medium or large frames, with a teen sized bike, a tag-a-long bike and a child's seat. To hire this lot would cost over 700€ a week. The Blavet Valley is popular with cyclists, and has been given official recognition for its newly formed tracks and circuits - To date, there are 100 km of way-marked routes waymarked over 9 trails. The Blavet Valley is about 20 miles west of Guegon. Near to the east of the cottage, the Voie Verte (green route) follows the path of the old railway line from Mauron to Questembert on a 53km surfaced trail. This provides an excellent, safe, traffic free route through some beautiful countryside, which is perfect for both walking and cycling. The track is split into manageable portions between the main towns and villages. There is a map available showing you where you can get food and drinks along the way at auberges or creperies. Alternatively, take some lunch with you and have a picnic. 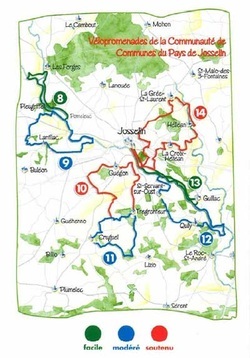 The map (right) illustrates seven of the local cycle routes in the Pays de Josselin area, and is taken from a leaflet that will give you an idea of the routes you might take (leaflet in French available in the cottage). The cycle routes are graded easy (green), moderate (blue), and hard (red) so there should be something to suit most tastes and abilities. Cycle route No.10 goes virtually past the front door of our cottage, and the route is waymarked with signs on the ground. This particular one is rated as 2hrs/19 km, but it is much more fun to take a picnic and make a leisurely half-day of it. Note: it is now compulsory for under 12 year olds to hear a cycle helmet either riding a cycle or as a passenger in a child seat when on a road - please bring your own helmets or else stick to the off road tracks and canal paths (we have provided 4 child helmets at the cottage which you can use if you don't have your own). We have purchased a full set of cycle route cards for your use at the cottage, and local maps at 1:100 000 are provided. Click here to read why the owner of Breton Bikes reckons that Brittany is one of the best cycling areas in France. We find that one of the great joys of holidaying abroad is the opportunity to eat out, and perhaps to try something a bit different from what we are used to. 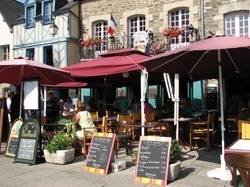 Within the Morbihan region of Brittany there is a great choice of restaurants, creperies, grills and pizzerias, catering for most tastes and budgets. With over 700 miles of coastline, seafood is the main Breton speciality. The classic 'fruits de mer' platter will contain the best of the local seafood, likely to include oysters, clams, mussels, scallops, lobster, winkles, crab and prawns, but will vary according to the coast, the season and catch. The best seafood restaurants have signed up to a charter that guarantees freshness and quality offering a choice of six different sorts of shellfish and crustaceans accompanied by rye bread and white bread, homemade mayonnaise and salted-butter. The second great Breton favourite is the pancake, or more accurately the crêpe and galette. The main difference between crêpes and galettes lies in the making of the batter. The batter for galettes is made from buckwheat flour and water, whereas the batter for crêpes is sweet and made with milk. Galettes are a savory dish served with ham, cheese and eggs - the typical complète. Crêpes are eaten for desert- the butter and sugar crêpe is the classic one. When it comes to drink, the Breton's favourite is cider rather than wine. It is said that the French would not allow vineyards to be planted in Brittany, so they produced cider instead. There are a wide variety of cider types to choose from, and some of the best is made locally at by Cidrerie du Terroir at Lizio. 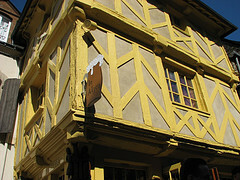 As for where to eat, there is an excellent variety of places in the nearby medieval town of Josselin. We have identified some of these by location on a google map. A favourite with the French are the Restaurants du Terroir, the traditional Breton restaurants 'of the soil'. These serve the best of local produce cooked to authentic traditional recipes. You can find out more about the local food and drink at the Brittany Tourism website. Fest Noz are often held in conjunction with a Pardon but not always. A fest-noz involves much food and drink, and above all music and dancing. All kinds of Breton and other Celtic music can be heard, from very traditional singers and instrumentalists, to younger bands with rock or jazz influences. The dances are always traditional Breton dances done in a circle (or many circles). The local village, Guegon, have an annual Fest Noz outside the village church on the eve of Bastille Day. Music festivals are a popular part of the summer cultural calendar for Bretons. We attended a festival one July at Pont l'Abbe and had a great time. We arrived in the morning and stayed all day! All the streets were closed off for the day (Sunday), and entry was by payment only. 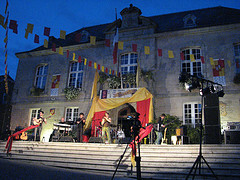 The festival commenced with a parade of bands, dancers, groups from all over Brittany and even abroad. It was a fantastic spectacle. The rest of the day was spent visiting the 3 or 4 stages set up in the Town Centre for different performances. Lunch was French style - great long wooden trestle tables to eat your choice of fresh fish food or barbequed food, wine, beer or cider. This is most definitely a genuine Breton festival, put on for Bretons not tourists, but we were made to feel welcome and thoroughly enjoyed the day. Definitely one of the highlights of our holiday, so if your trip does coincide with a music festival we would recommend a visit. Quimper - held over nine days at the end of every July and featuring a huge gathering of Celtic artists, musicians and dancers from all over Europe, Festival de Cornouaille is almost certainly the region's largest folk festival. Quimper is one of the best places to see regional costumes, and to listen to both popular and traditional Breton music. Rennes - Brittany's capital city gets in party mood at the beginning of each July with its Tombées de la Nuit, a spectacular street festival celebrating theatre, music, poetry and dance. The traditional music and contemporary Breton rock takes place side by side, catering for the tastes of Rennes' 45,000 students. Dinan - medieval days come vividly to life during Dinan's spectacular Fête des Remparts held over four days in late July. This is probably the largest celebration of medieval culture in Europe, and includes exhibitions of jousting, drama, dance, music and ancient crafts. As quite probably the most perfectly preserved medieval town in Brittany, and with a population immensely proud of this fact, Dinan is the perfect setting for such a display. Concarneau - is France's largest fishing harbour, and the town's Fête des Filets Bleus (Festival of Blue Nets) held in mid-August began life in 1905 as a fund raising exercise for distressed families of local fishermen.These days it is a traditional Breton festivity recalling the fishing, culture and music of the region. Celebrations include grand scale dining on seafood and singing of Breton seafaring songs. Festivities conclude with a huge fete, which every year attracts around 25,000 visitors. The Worldwide Encounters of Dance & Music festival, or "Le festival de la Baie", attracts more than 500 performers from several countries, ranging from local Breton groups to dancers from as far away as China, Bolivia, Russia. The event is held every year in early August. There is also a huge crafts fair, with jewellery, rugs, clothes, pottery and musical instruments from countries including Brazil, India, Peru and Bali. Brest - held every four years since 1992, the Brest Maritime Festival has rapidly grown into a truly spectacular affair. In mid-July 2004 it attracted over 2,000 traditional sailing craft and tall ships from seafaring nations all over the world. In addition to a wealth of maritime heritage, music and other forms of entertainment from these countries also featured heavily, as did many fine replicas of the world's historic vessels. Full-scale festivities usually cover six days, and include firework displays and concerts every evening. Saint Brieuc - held in late May, the Art Rock Festival in Saint-Brieuc combines modern music with performance art, and attracts over 35,000 visitors every year. The festival concept is to draw together contemporary music (pop, rock, jazz or DJ-ing) and art (theatre, dance, plastic arts, video, multimedia etc). The varied programme combines international stars with established artists to create something entirely new. Past participants have included the Fun Lovin' Criminals & Happy Mondays as well as new French and Breton talent. St Malo - La Route Du Rock Festival has two shows a year, one in summer and the other in winter. Lasting for three days, the festival continues to attract a diverse array of quality performers, and the idyllic location is ideal for those who enjoy catching a few rays while checking out the music. Vannes - each year Vannes has a six day jazz festival. There are many other smaller local festivals held throughout the summer - look out for details advertised on bus shelters and supermarket notice boards. Brittany is France's most favoured region for game fishing. The Elorn, Blavet, Ellé, Triieux, Aulne, Steir and Odet are all rivers which flow swiftly down from the flanks of the ancient Armorican plateau, and where fine salmon can be caught. Excellent trout can also be caught in the above rivers, as well as in the Vilaine, Scorff, Penzée, Leff and Léguer. In the quieter waters to the east there is an abundance of pike, perch and other coarse fish. 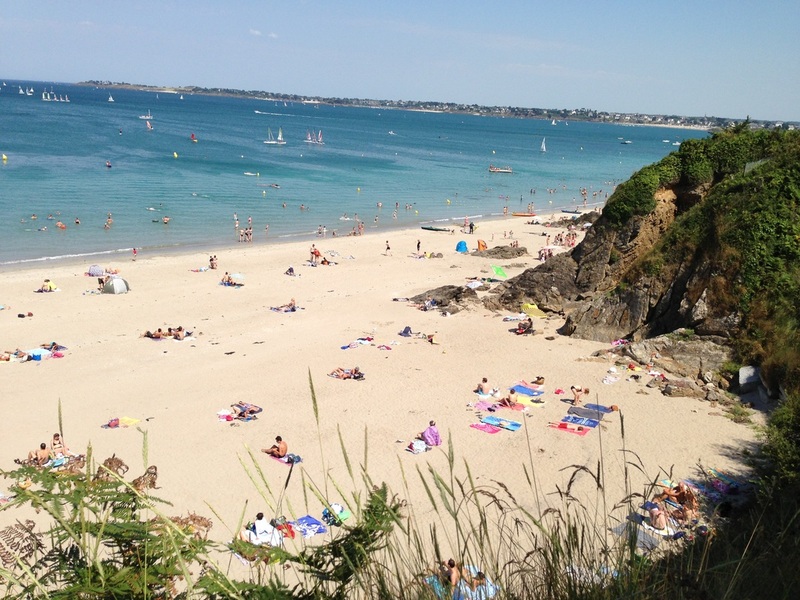 A holiday permit (la Carte Vacance) was introduced several years ago to give visitors a fortnight's access between June 1st and September 30th to all fishing grounds within the Morbihan. It costs around 30 Euros and can be purchased from bar tabacs. Note that you are still subject to the rules concerning quotas and sizes. Lake fishing can be arranged at the Duke's Lake (Lac au Duc), nearby, for perch, carp and pike. There is also the Nantes-Brest Canal, and a large fishing lake just outside Guegon which is popular with locals. Fishing from a sea-side beach does not require a permit. There is also a good selection of bases along the coast where you can go deep sea-fishing for the day, such as the Port d’Etel (Tel: 02 97 55 23 80) they are very helpful and you can fish for either a whole day or half a day. The warm sunny climate in Brittany is well suited to planting out formal gardens, and there are 29 gardens recommended by Brittany Tourism. These gardens are often located within the grounds of chateaux or historic buildings. Some of the closest gardens to the cottage are the hydrangea garden at Ploermel, and the chateau and forest park at Loyat. The Chateau at Josselin includes several themed gardens and once a year in July the Duke of Rohan hosts a special plants weekend where he is on hand to discuss his plants. If golfing is your chosen holiday activity, you'll spoilt for choice in the Morbihan. There are five 18-hole courses within 50 minutes drive. One of the nearest courses is at the Lac au Duc at Ploermel (Dukes Lake). 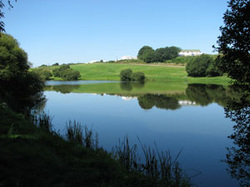 A challenging 9 hole course running alongside the largest inland lake in Brittany. The course is owned and maintained by the Hotel Roi Arthur and has varied and interesting holes (including a 500 yds plus par 5). Walking is easy as the course is mostly flat. 9 hole courses at Rimaison and Lac au Duc. 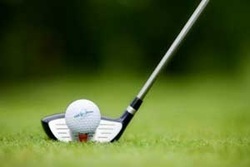 18 hole courses at Lac au Duc, Val Queven, St Laurent, Ploemeur-Ocean, Baden, Rhuys-Kerver. A good website for information on golf sites in Brittany can be found at Brittany Tourism, with diagrams of the course layout, access details and cost. St Laurent was a chosen venue for the French Professional Championships in 1988 & 1989, and the National Open in 1995. All the courses are pay and play. Brittany has a wealth of historic towns, and the best have been designated as 'Small Towns of Character', 'Towns of Art and History', or 'Historic Towns'. In total, there are 50 such towns. collectively they represent the most authentic and well preserved urban areas of the region, and a day out to one or more of these towns is unlikely to disappoint. Petite Cité de Caractère are 20 small towns of fewer than 5000 inhabitants. 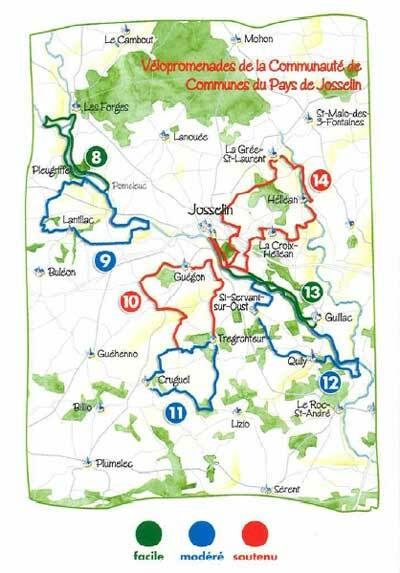 The nearest towns to us are Josselin, Lizio, Malestroit, La Roche-Bernard, Rochefort-en-terre. Without exception, they are all lovely places to visit, and we would recommend a visit to all five if you have time - perhaps combine several into a day trip. You will find more information and photos of these towns in the Places to Visit section of our web site. Villes d'Art et d'Historie de Bretagne: This is a title conferred by France's Ministry for Culture an towns with a special artistic and historic interest, together with strong cultural traditions. You are likely to find discovery tours, exhibitions and an interpretative centre about the local architecture and heritage, and summer events and workshops. The nearest such towns are Vannes, Auray, Rennes, Dinan, St Malo, Concarneau and Quimper. Historic Towns: These towns do not reach the same standard of those above, but are still recognised as being of significant historic centres. These towns have a heritage maintenance and promotion policy, and provide support for the contemporary arts. The nearest towns to us are Pontivy, Hennebont and Quimperle. 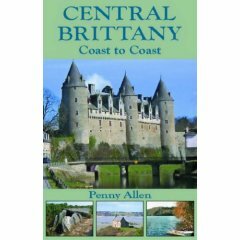 Brittany is ideally suited for riding and trekking, with its gently-rolling hills and attractive countryside. From beach rides to treks, Brittany offers over 2,000 kilometres of bridle paths (signposted with orange markers). The stables at Le Resto, near Bieuzy Le Eaux. Centre Equestre de Broceliande: Horse riding, lessons, competitions and stabling, at Loyab. Kerguelen Equitation : Pony club and horse riding and trekking along the beach. Kerguelen, Larmor plage. Try the Ker Pony Prado at Guer and take the children around the specially designed course. The horse farm at La Croix-Hellan is said to be good. For something slightly different go to the centre at Redon and take a trek along the River Vilaine. 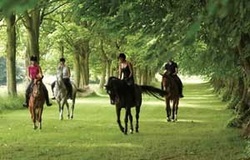 Centre Activites Equestres: Horse riding and horse trails and other horse activities, at Le Terrier, Trehorenteuc. You groom the horse, saddle it up then go out in the countryside where you are escorted round by your own guide. You can trot, canter or gallop depending on your ability and the horses are said to be as good as gold. There is an outdoor go-karting track for children and adults located at Circuit de la Pyramide, Guillac, just 5 miles [10 mins.] east from our cottage. 3G Karting have a 620 metres outdoor track and facilities include a car park, creperie and reception area. Adult karts 2 and 4 stroke, childrens 100cc karts from age 7, and full safety equipment (helmets and gloves) are available to hire. They cater for both teams and individuals. A little further afield is the Karting Du Pays D'Auray at Ploemel, with 10 karts for children, and 50 for adults. The circuit is 800m and they open from 10am to 8pm during school holiday periods. Ile de Groix - Located in southern Brittany, 14 km offshore from Lorient, the Ile de Groix is 8 km long and 3 km wide. This island, which at the beginning of the century was the largest tuna fishing port in France, is today an exceptional nature reserve. It is also noted for having the only convex beach in Europe (goes out in an arc from the shore into the sea). Belle Ile en Mer - Located 15 km offshore from Quiberon, Belle-Île, baptised Kalonessos (beautiful island) by the Greeks, is the largest of the Breton islands. Its 84 km_ offer a wealth of sights, and the island is a haven for wildlife. A plateau 20 km long, the island has a central ridge, with several valleys leading off to “ports”, small beaches tucked away in set-back inlets. 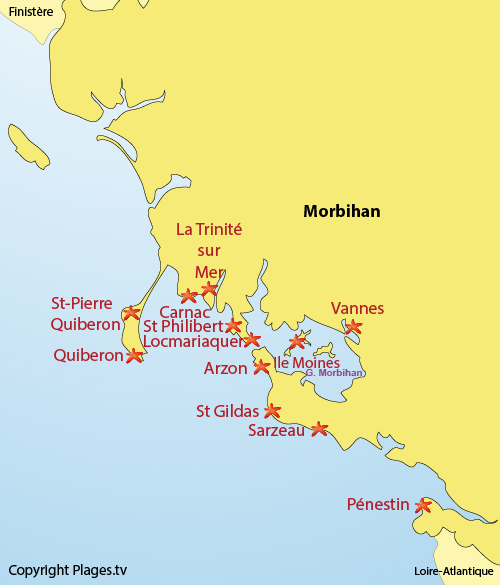 There are said to be 365 islands within the Gulf of Morbihan. Many of these are in private ownership, but others can be accessed by boat. There are boat trips from Vannes, Port-Navalo, Auray, La Trnitie or Locmariaquer. It is possible to walk across the sand to Ile Berger at low tide. This beautiful lake is located in the boroughs of Loyat, Ploërmel and Taupont. It covers 618 acres and is 5 to 7 metres deep. The Lac au Duc is 3.41 miles long and between 500 m and 900 m (547 to 984 yds) wide and has formed on the course of the little river of Yvel. The Lac au Duc, is an excellent site for relaxation or for water sports enthusiasts with the Club Nautique providing dinghies, catamarans, optimists, windsurfing, mini windsurf, canoeing, rowing, water skiing, etc. There is a supervised beach with full amenities, tennis, volley-ball, golfing, angling, walking or rambling, fitness trail, horse riding, bathing, water slide, etc. It is equipped with playgrounds, picnic areas and a cafe. All in all the Lac au Duc is a great leisure activity centre in which you can pursue your favourite water sports activities, or just relaxing the calm of the natural environment. The Hortensia Trail is unique in Brittany and is an invitation to stroll along and discover this botanical path. The walk runs along the edge of the lake through an arboretum where hydrangea, the flower of Brittany, burst open in all their splendour. There are pink, blue, mauve, white with sun-yellow centres, two-coloured hortensias, etc., from the smallest and most delicate species to what are truly flowering trees. About 2,000 hydrangeas of 220 different species are planted, and flower between May and October. The outer walk is 3km/1hr30 and inner walk 0.8km/0hr30, and both start from the parking area near King Arthur Hotel. Please note: The water quality in the lake is regularly checked, and in a very dry summer the lack of fresh water entering the lake can reduce the water quality levels to an unacceptable standard. If this happens the beach will have notices saying you cannot enter the water. Local markets are one of the highlights of any visit to France, and there are plenty to choose from, with a market happening somewhere every day of the week. Markets are not put on for tourists - they are where locals go to shop and chat to friends. Visit a local market to find the best local Breton oysters, cheeses, crepes, cider, honey, meat, flowers, olives, fruit and vegetables. The French still consider the local market to be the best place to buy the freshest produce at the keenest price, so join them! 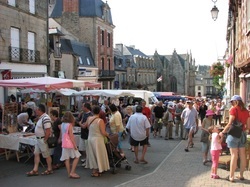 Don't underestimate how long it will take to do your shopping at a busy summer market in Josselin - you can tell the best stalls by the number of locals queuing! Rennes - every day except Sunday and public holidays in the central food halls, Saturday morning "aux Lices"
We recommend you visit our local Saturday morning market at Josselin and the Wednesday market at Vannes. You will also come across regular antique markets, flea markets and the French equivalent of car boot sales 'Vide Greniers' (attic sales). A large flea market takes place in Guegon each Easter and it is a great place to pick up some French collectables, such as the old cast iron Gendarme's Irons that we bought for our fireplace. Sheltered in the Quiberon Bay, Carnac is known worldwide for its alignments of menhirs and its five beaches of fine sand. Carnac enjoys a mild climate all year round and offers to the visitor a historical heritage unique in the world. Heritage Prehistory Museum: it houses the rich archaeological heritage of Carnac area, it relates of man's evolution and the different civilisations of the region. This site is the best in the world for the Megalithic Period. 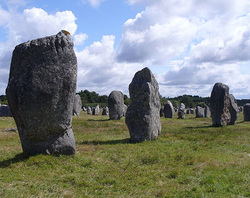 Menec Alignments: the site comprises 1099 menhirs and starts with a "cromlech" (hemicycle) of 70 menhirs, surrounding in parts, the Menec hamlet. Kermario Alignments: the eastern continuation of Menec alignments, spreading over tourism km, the site comprises 1029 menhirs. Kerlescan Alignments: 540 menhirs following a vast cromlech of 39 stones. Saint Michel Tumulus: 120m long and 12m high. From the summit, an exceptional view over the Quiberon Bay. Unless you are very interested in prehistory we don't recommend you make a special journey just to view the stones, but perhaps you can combine this with a visit to Carnac town and beach. Follow this link for a good web site on the megalithic sites at Carnac. A pardon is a religious festival held once a year at a church to honour the local patron saint. Sometimes it involves only the small village church, for others it involves the whole parish and many churches. There is usually a procession with the priests at the head, and all the people following and singing, and carrying the colourful banners of their churches. These have been going on since the Middle Ages in Brittany. The parson Pardon de Notre-Dame du Roncier in Josselin has been held each year for 1,200 years, and is the third largest in Brittany (7th to 8th September). Whether for competitions, regattas or simple sailing trips, Brittany is an ideal location for water sports and activities, thanks to its 3500 kilometres of coastline, broken up into creeks, inlets, roadways and bays, together with its many rivers and lakes. Today there are 120 sailing schools and 230 water sports centres. Throughout the year, from regattas to sailing instruction sessions, Brittany’s sailing schools and clubs offer a vast range of activities: single and double sailing dinghies, catamarans, sailboarding, funboarding, group and pleasure trip boats. You can book a day trip on the Sloop Langoustier sailing boat (lobster boat) built in 1931 and sail round the stunning Golfe du Morbihan and learn all about the history of sail and this old sloop`s place in the Resistance during the Second World War. One of the nearest places to sail is at the Duke's Lake, Lac au Duc, at Ploermel. La Trinite sur Mer is home to many of the world’s top racing sailors and there are regattas and sailing events taking place throughout the year. Enjoy a good lunch overlooking the water whilst watching the quayside activities. At larger beaches you can hire equipment, or take a private course using high performance equipment and in good condition. You do not need to make a booking, you can turn up at your leisure and you will find boats, already prepared, waiting for you. Located on the shore, often in wooden huts clearly identifiable, well informed staff at a “Passion Beach Point” provide professional advice, supervision of the water area and guarantee you the same quality of services and product wherever you go. More information on sea-sailing in Brittany is available here. 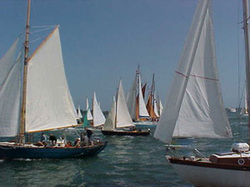 The Nautisme en Bretagne site offers further information on all types of watersports in Brittany. Sand-Yachting / Sand-Karting is popular on the Quiberon Peninsula. There are a number of schools and hire centres, who provide instruction if required. The sand-karting world champion is lives in Brittany, and there are 17 sand-karting clubs. It may be the most spectacular part of sand yachting : pilots being able to go faster than the speed of wind as soon as they are on the sand. They can easily reach thirty to forty kilometers an hour, even on a beginner sand yacht. Even at this stage, thrills are already guaranteed, as you graze the sand by a few centimeters, while with the help of a “rudder bar” you manoeuvre your sand yacht with your feet. 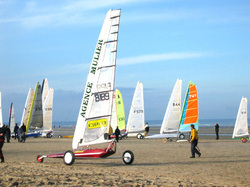 A list of clubs offering sand yachting is available on the Nautisme en Bretagne site. 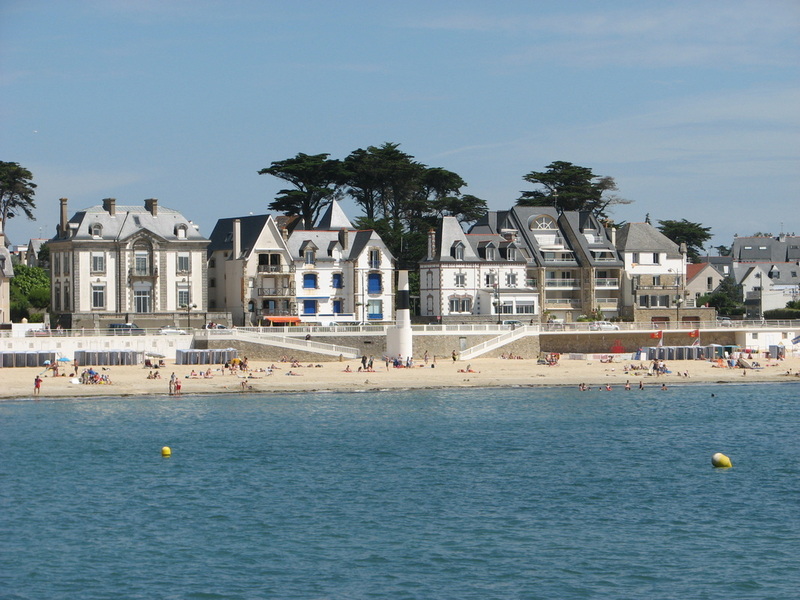 The waters of the Morbihan coast are popular with scuba-divers, there is much to explore. Many clubs have activities for beginners as well as guided explorations, visiting wrecks and even underwater photography courses. There are scuba diving centres throughout Brittany to cater for all tastes - exploration scuba diving, harpooning, archeology, the options are endless. The relative moderate depth of (under) water beds (from 10 to 60 meters) and the significant number of ship wrecks offer an impressive choice of wrecks to explore.From beginners to accomplished divers, Brittany offers something for all abilities. 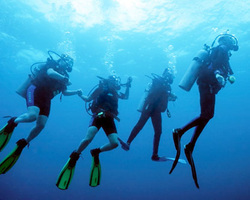 Made in Blue is one Diving School based at La Trinité sur Mer. Scubaventure in Vannes are highly rated. A full directory of diving schools can be found on the Nautisme en Bretagne site. Cap Fréhel, Dossen, Petit Minou, Palue, Torche, Guidel or the Presqu'île de Quiberon are acknowledged sports centres open throughout the year in Brittany for surfing, long board, body board, skim board, body surf etc. However, these technical disciplines require a good knowledge of the water, the type of wave “sand, rock, reef ”, of the wind “off shore, on shore”, of the currents and the ability to swim well in the sea. 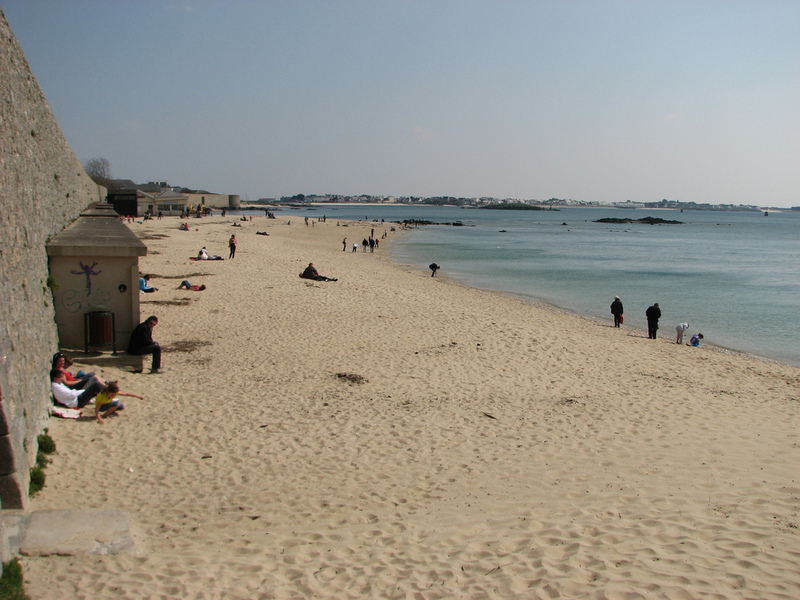 The Quiberon Peninsula is popular for all types of surfing and tuition is available at a variety of centres. Windsurfing is also possible at the nearby Lac au Duc which has its own watersports centre. The places indicated in red on the map to the left are those popular with surfers. Check out wannasurf.com for surf information. Nautisme en Bretagne has details of surf schools and clubs. There is a very large open air pool at Pontivy 50m x15m open summer months 11am-7:30pm daily. [22miles/30min]. 50 metres should be long enough for even the keenest lane swimmers! The nearest indoor pool is at Ploermel 25m x 10m [11miles/13min]. There is also another at Baud. The nearest outdoor pools are at Plumelec [7miles/10min], and Serent [10miles/16min] - we have used them both and found them to be excellent. Our children prefer the Plumelec pool because it has water slides. For off-season breaks, the indoor swimming centre Les Aquatides at Loudeac [22 miles/33 min] is worth a trip. As well as the 25m swimming pool, there is a 70m water slide, fountains, lagoons and rivers, jacuzzi and spar bath. For indoor and outdoor pools men will need to wear Speedo style swimwear as shorts style swimwear is not allowed. 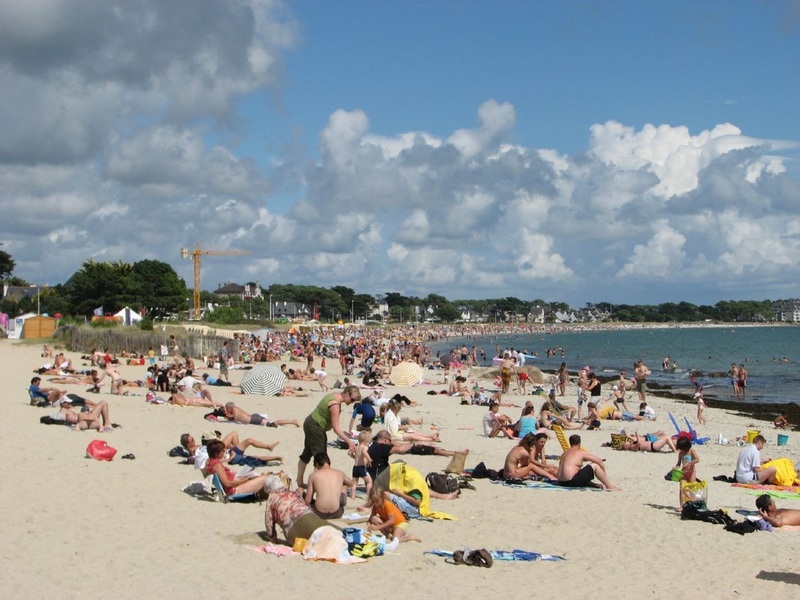 The Lac au Duc provides supervised lake swimming with a man-made sandy beach, or you can always take a dip in the sea - the water of the Southern Brittany coast is a bit warmer than the north and west coasts. 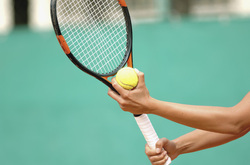 Guegon has its own outdoor tennis courts, just 5 mins from the cottage. Many other towns and villages also have tennis facilities e.g. there is an indoor tennis court at St Barthelemy. There is a minimal charge. Tuition is available if required. 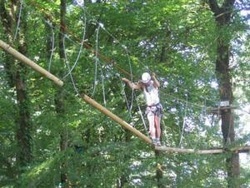 Roc Aventure is a tree based adventure course located at nearby Le Roc-Saint-André, 9 miles/0h20 from the cottage, or you can cycle there along the canal path via Saint-Gobrien if you are feeling doubly energetic. They provide courses suitable from 4yrs, 6yrs, 8yrs, and 14 yrs. Open weekend afternoons April-October and everyday 11am-5pm in July and August. They are located next to the camp site. And now for something a bit different... cycling along railway lines! The French have come up with a great use for disused railway lines. Using a frame they attach two cycles and adjust the distance between the bikes so each cycle is exactly over one of the rails. Then you have a velo-rail! These Velo-Rail sites can be found throughout France and our local one in Brittany is found at Medreac 45 miles/1h00 from the cottage. Cycling along not having to steer or even hold the handlebars feels a little strange, but allows you to concentrate on enjoying the scenery. We calculated that the route is actually only 3.65 miles each direction, so 7.3 miles in total. At a sedate 5 mph you can do this route in 1.5hrs easily, so you might as well take your time and have a picnic at the end of the line (tables provided). The cafe was only serving drinks and ice lollies , not food so don't rely on eating there. Children over 8yrs have to ride their own cycle. All in all great fun and good exercise! Check out the Medreac Velo-Rail website for full details of opening times and cost. Take a short walk of 3km right from the cottage front door - ideal for sunny evenings. You can plan many variations on this walk using the map. A way marked cycle route/walking route passes by the hamlet Circuit de Tregranteur (follow the link to see the route on Google Maps), 11km/2h30 foot or cycle. You will find a pack of walking/cycling route cards at the cottage containing details of 30 routes, with varying lengths from 5 to 30 km. The nearby Lac au Duc (Dukes’ Lake) has a circular walking trail planted with hundreds of Hydrangea shrubs (leaflet in the cottage). You can also walk a circular route of 13.6km around the entire lake if you are feeling energetic, allow about 3h30. The Cirkwi website has dozens of walks listed with maps and routes and is sure to provide you with some inspiration (French but Google Chrome will translate it for you). You can walk along the entire length of the Nantes Brest Canal path. 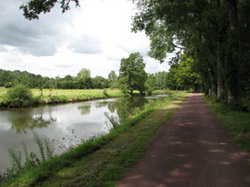 The Voie Verte (green route) is a converted railway-line foot & cycle path of 53km from Mauron to Questembert. The small town of Lizio is the base for two pleasant circular waymarked trails. Look online at the Broceliande website walking routes (French). Brittany has a total of 1,700 kilometres of coastal footpaths running along capes, headlands, dunes and beaches. These footpaths are extremely accessible and follow the entire length of the coastline, passing through superb scenery. Now maintained for rambling and walking, they once had a major role to play in coastal surveillance, being originally used to combat smuggling and wreck-looting, hence the term "Customs Paths". But times have changed, and these paths are now the preserve of nature-lovers, dedicated hikers, those keen for a taste of adventure and others simply out for a stroll. In France there is a national network of walking paths. Apart from the Coastal Path (the GR34) many other Grandes Randonnees, as they are called, go through Brittany. They are marked with white and red signs. Smaller walking paths (known as GRPs) are marked with yellow and red signs and are planned to offer a week of walking. PRs are even smaller and are marked in yellow (or sometimes with a thematic "walking" symbol) and are meant to last from an hour to a whole day. The signposts along these routes give you the time, rather than the distance, which might take a little getting used to. The times are calculated on a steady walking speed of 4km an hour without any stops. 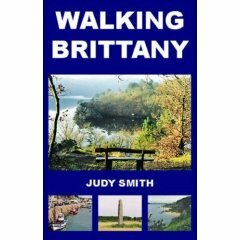 More information on walking in Brittany is available from FrenchEntree. The above guidebooks, plus many others and maps, are available for your use in the cottage. 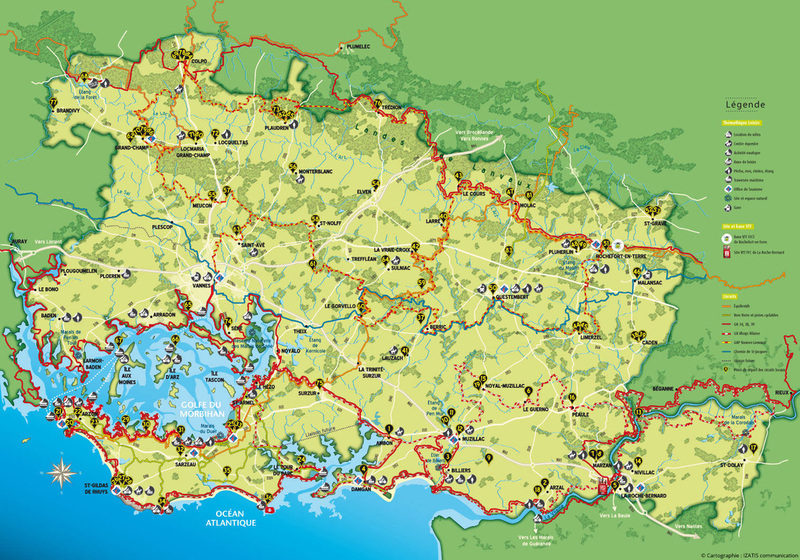 Further information on walking in the Vannes region can be found here.